The Nex Flow™ Vacuum Suction Cups are reliable vacuum cups that can handle objects weighting from a few grams to several hundred kilograms or pounds. Nex Flow™ suction cups can move different products and materials from simple, fragile, compact parts or objects that are curved, with uneven surfaces, as well as flat or angled parts. Special designs are available to address even the most fragile of applications proving a return on investment of reduced waste in handling, longer life for the cups and overall lower costs. All Nex Flow™ suction cups are made from Polyurethane (PU) with superior flex resistance, and lower likelihood of flex cracking and can last twice as long as competitive materials. 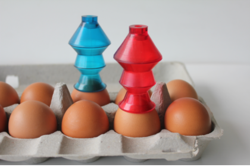 The Nex Flow™ suction cup size range increase includes new a new Specialty EG Range of Polyurethane (PU) vacuum cups designed for delicate and complicated applications such as egg handling and processing and for gold ball printing. Below 1.5, Size from 5-20 with the hardness of 60 Shore (for small objects). NEW: Below 1.5 Size from 15 -70 with the hardness of 30/60 shore. Below 2.5 Size from 20-70 with the hardness of 30/60 Shore. (for level adjus™ent on uneven surfaces such as cardboard. The 2.5 bellow have difference shore hardness, and makes the suction cups stable and flexible).